This fast-paced competitive Hoop Zone inflatable sports game will have participants offering up their best shots, in this 3 level point scoring basketball game unlike any other. Score 10, 30 or 50 pionts with each shot made in the designated hoops. After each shot the balls are automatically returned to accumulate even more pionts. 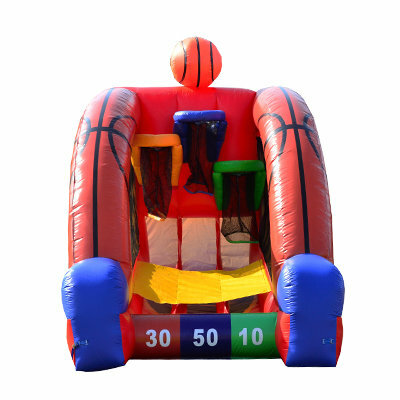 The Hoop Zone inflatable basketball game rental is perfect for any indoor or outdoor event. This spirited inflatable game is sure to attract plenty of NBA stars.